Accessory pathways are anomalous extranodal tissues that connect the epicardial surface of the atrium and ventricle along the atrioventricular groove. Accessory pathways can be classified based on their location along the mitral or tricuspid annulus, type of conduction (decremental or nondecremental), and whether they are capable of antegrade conduction, retrograde conduction, or both. Accessory pathways that conduct only retrogradely are termed "concealed" since they do not cause ventricular preexcitation and cannot be detected by ECG. Accessory pathways that conduct antegradely are termed "manifest" because they are demonstrable on a standard ECG as a short PR interval and a widened QRS complex with a slow and prolonged upstroke, referred to as a delta wave (Fig. 5A). This ECG pattern is termed "preexcitation" because it results in early activation of the ventricle through the accessory pathway that bypasses the normal AV conduction. Patients are diagnosed with WPW syndrome when they have both preexcitation and symptomatic tachyarrhythmias. Fig. 2. (A) Schematic drawing of the posterior, or slow pathway, approach to ablation of AVNRT, in which ablation catheter is positioned anterior to the CS ostium. (B) Intracardiac electrogram characteristics of a successful slow pathway ablation site. At the ablation site (ABL), the ventricular electrogram is considerably larger than the atrial electrogram, and a slow-pathway potential is seen immediately after the atrial electrogram. is preexisting or functional bundle-branch block. 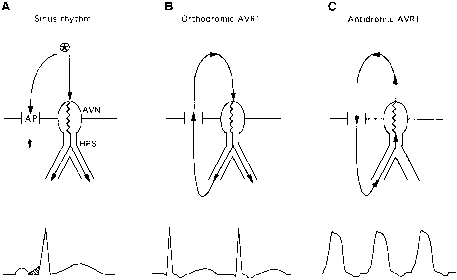 In contrast, antidromic AVRT is typically a wide-complex arrhythmia, because the reentrant impulse travels from the atrium to the ventricle via the accessory pathway and then back to the atrium retrogradely through the normal AV conduction system (Fig. 5C). Even in patients with manifest accessory pathways, orthodromic AVRT is the most common form of PSVT. 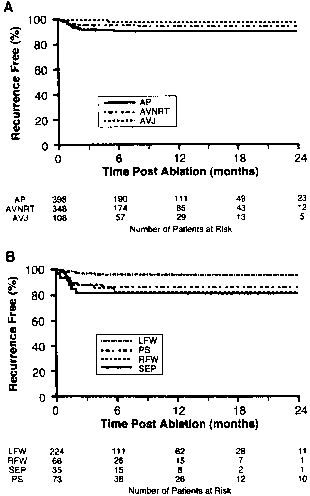 Atrial fibrillation (AF) is a less common but potentially more serious arrhythmia in patients with WPW. It can result in a very rapid ventricular response through the accessory pathway, with degeneration into ventricular fibrillation (VF) in rare cases. The incidence of sudden cardiac death in patients with WPW has been estimated to be 0.15% per patient year (28). Indications. Referral for electrophysiology testing and catheter ablation is recommended for all patients with symptomatic WPW, as it is associated with an increased risk of sudden death. 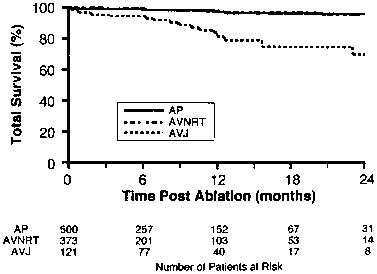 Radiofrequency ablation is also recommended for patients with suspected AVRT involving a concealed accessory pathway if it is drug-resistant or the patient is drug-intolerant or does not desire long-term drug therapy (18). There is divided opinion as to whether patients with asymptomatic ventricular pre-excitation should be considered for electrophysiology testing and catheter ablation. At the present time, this approach is generally reserved for patients whose livelihood or profession, important activities, insurability, or mental well being, or the public safety, would be affected by spontaneous tachyarrhythmias or the presence of the ECG abnormality. Fig. 5. 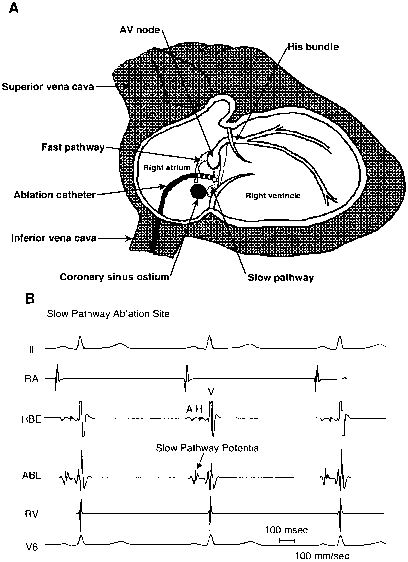 (A) Schematic representation of early activation of part of the ventricle through rapid anterograde conduction over an accessory pathway (AP), resulting in a delta wave (initial shaded portion of QRS). (B) Orthodromic atrioventricular reciprocating tachycardia (AVRT), in which no delta waves are seen, because ventricular activation proceeds through the normal conduction system and retrograde through the accessory pathway to the atrium. (C) Antidromic AVRT, during which anterograde conduction proceeds to ventricle entirely over AP, resulting in maximal pre-excitation with wide QRS complexes. Techniques. An important part of catheter ablation of accessory pathways is the diagnostic electrophysiology test, in which the presence of an accessory pathway is confirmed, its conduction characteristics are determined, and the role of the accessory pathway in the patient's clinical arrhythmia is defined (29). Accurate localization of an accessory pathway is critical to the success of catheter ablation procedures. In patients with preexcitation, preliminary localization of the accessory pathway can be determined based on the delta wave and QRS morphologies (30). Mapping of concealed accessory pathways and accurate localization of manifest accessory pathways require analysis of the retrograde atrial activation sequence and/or antegrade ventricular activation sequence. Right-sided and posteroseptal accessory pathways are typically localized and ablated using a steerable catheter with a 4-mm distal electrode positioned along the tricuspid annulus or in the CS ostium. The general location of a left-sided accessory pathway can be determined using a multipolar electrode catheter positioned in the CS, which runs parallel to the left AV groove, or with a steerable catheter positioned on the mitral annulus. Once localized to a region of the heart, more precise mapping and ablation are performed using a steerable 4-mm tip-electrode ablation catheter positioned along the mitral annulus using either the transseptal or retrograde aortic approach. These two approaches for ablation of left-sided accessory pathways are associated with similar rates of success and incidence of complications (31). The decision as to which approach to employ is usually based on physician preference, although the transeptal approach may be preferable in the elderly and in young children. Rarely, left-sided accessory pathways can only be ablated via the CS (32). Appropriate sites for radiofrequency energy delivery during ablation of manifest accessory pathways are characterized by early ventricular activation, the presence of an accessory pathway potential, and stability of the local electrogram (33) (Fig. 6A). Appropriate sites for energy delivery in patients with retrogradely conducted accessory pathways mapped during ventricular pacing or orthodromic AVRT are characterized by continuous electrical activity, the presence of an accessory pathway potential, and electrogram stability (33). Once an appropriate target site is identified, 25-50 W of radiofrequency energy are delivered for 30-60 s with a target electrode temperature of 60-70°C. At successful ablation sites, interruption of conduction through the accessory pathway usually occurs within 10 s, and often within 2 s, of the onset of radiofrequency energy delivery. This is demonstrated by disappearance of the delta wave for manifest pathways (Fig. 6B) and a change in retrograde activation sequence for concealed pathways. Outcomes and Complications. The reported efficacy of catheter ablation of accessory pathways varies from 89% to 99% with an overall success rate of approx 93-95% (27,29,34-39) (Fig. 3A). The success rate for catheter ablation of accessory pathways is highest for left free-wall (95%) and lowest for posteroseptal (88%) and right freewall (90%) accessory pathways (27). Following an initially successful procedure, recurrence of accessory pathway conduction occurs in approx 7-8% of patients (27,29,3439). Recurrence of conduction is more common following ablation of septal, right freewall, and posteroseptal pathways (27) (Fig. 3B). Accessory pathways that recur can usually be successfully re-ablated. Complications may result from obtaining vascular access (hematoma, deep venous thrombosis, perforation of the aorta, arteriovenous fistula, pneumothorax), catheter manipulation (valvular damage, microemboli, perforation of the CS or myocardial wall, coronary dissection, and/or thrombosis), or delivery of radiofrequency energy (myocardial perforation, coronary artery spasm or occlusion, transient ischemic attacks, or cerebrovascular accidents). Complete heart block during ablation of an accessory pathway occurs in approx 1%, observed most commonly after ablation of septal (2.5%) and posteroseptal (3%) pathways (27). 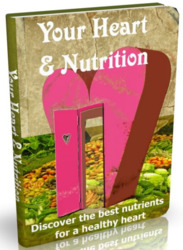 Overall, the incidence of complications varies from 1-4% (27,29,34-39). The incidence of procedure-related death is estimated to be less than 0.2% (2). 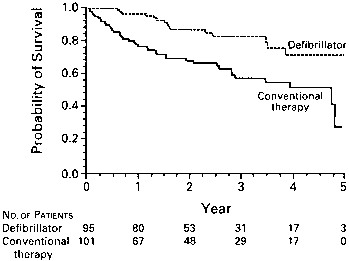 Long-term patient survival following catheter ablation of accessory pathways is excellent (Fig. 4).